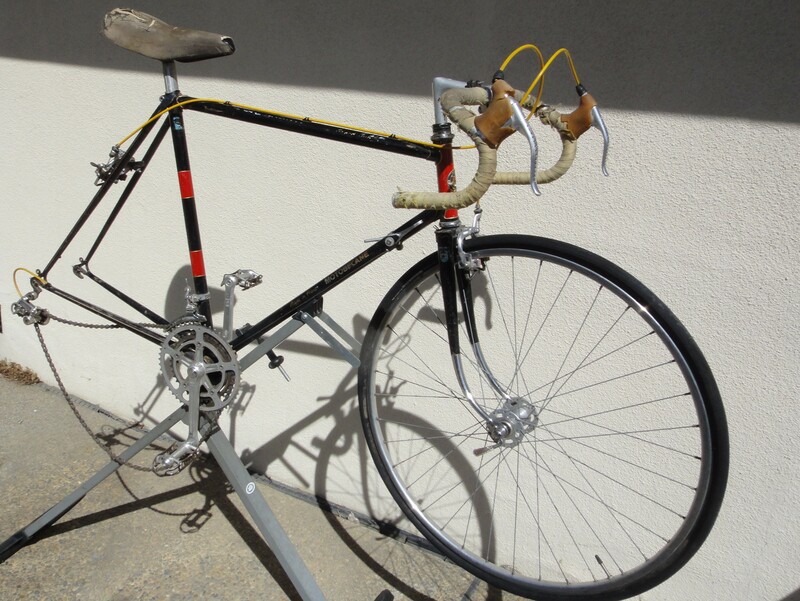 Flea market frame formed of double-butted Vitus 172 chro-mo steel tubes, as were the chrome-plated forks, sadly twisted. 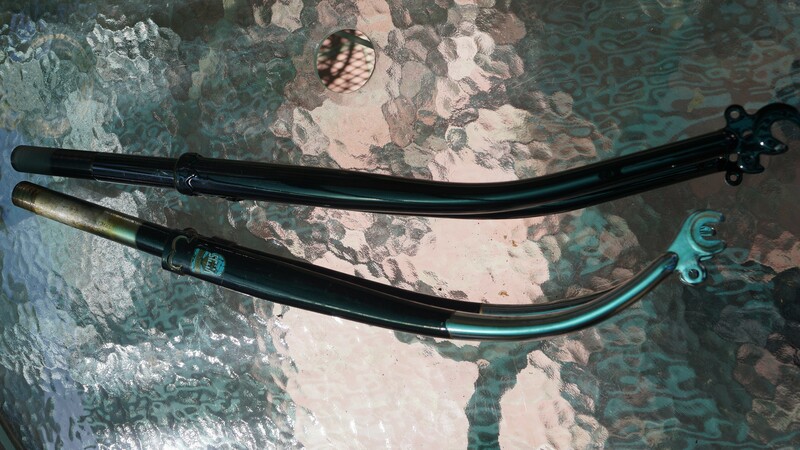 The after-market $75 forks resemble the stock ones except for less rake and more weight. Stock brakes were too short for 700c wheels so I used a vintage alloy Dia-Compe and a Raleigh side-pull from my parts bin. 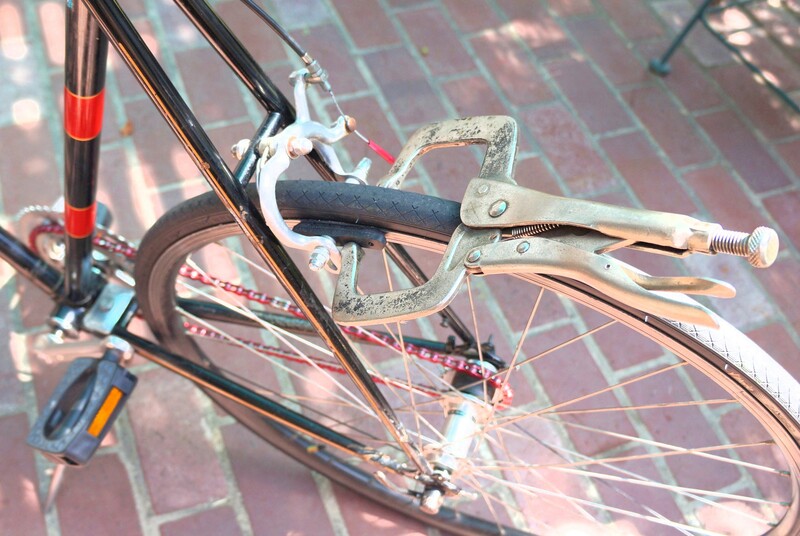 Unless you have a helper, you’ll need a 3rd-hand-tool to clamp the brakes down while you attach brake cables. I use this drywall clamp (UK:cramp). Remember to leave enough leeway on the adjusting barrel to adjust the shoes off the rims after you remove the clamp. This bike fought me every step of the way. 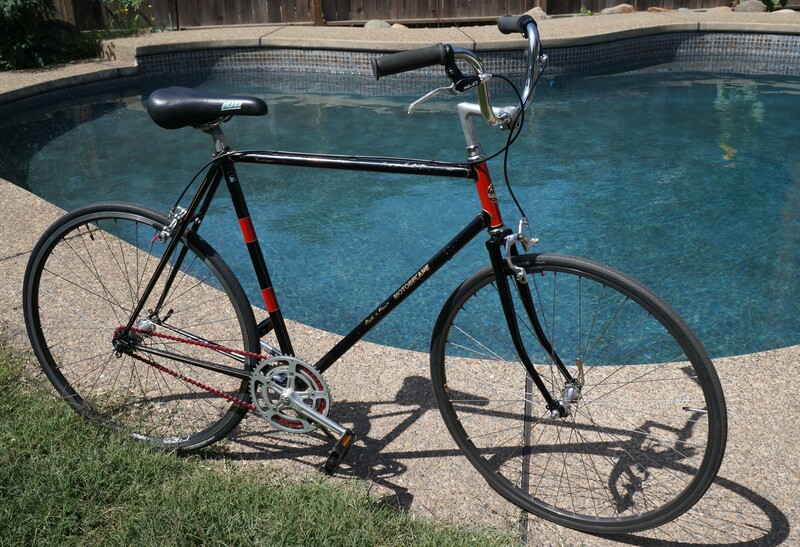 The Shimano wheel had scored ball bearings and races I had to replace: the headset was scored and I had to have a new one put in: seat-post was frozen and took repeat tolchocks with a ball-peen hammer between WD-40 treatments to free up. 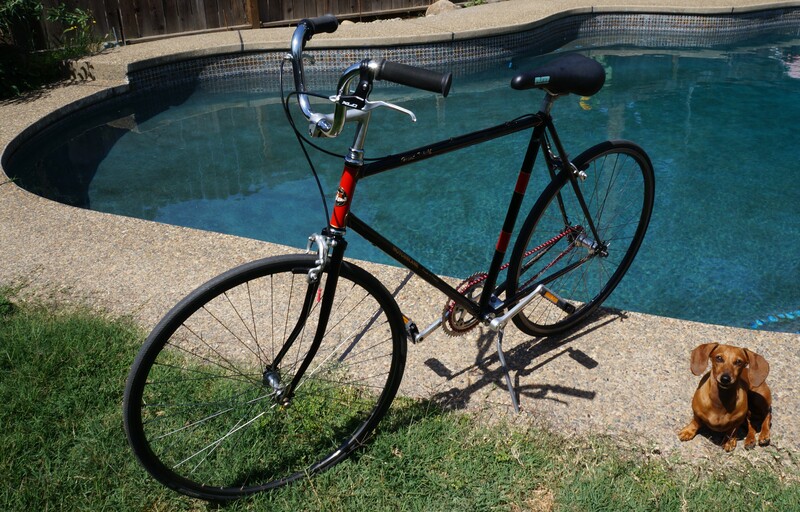 I was able to reuse the post after cleaning, along with the ‘7-shaped’ quill stem, SR Apex cranks, Sakae chain-rings, and original cup-and-cone bottom bracket. 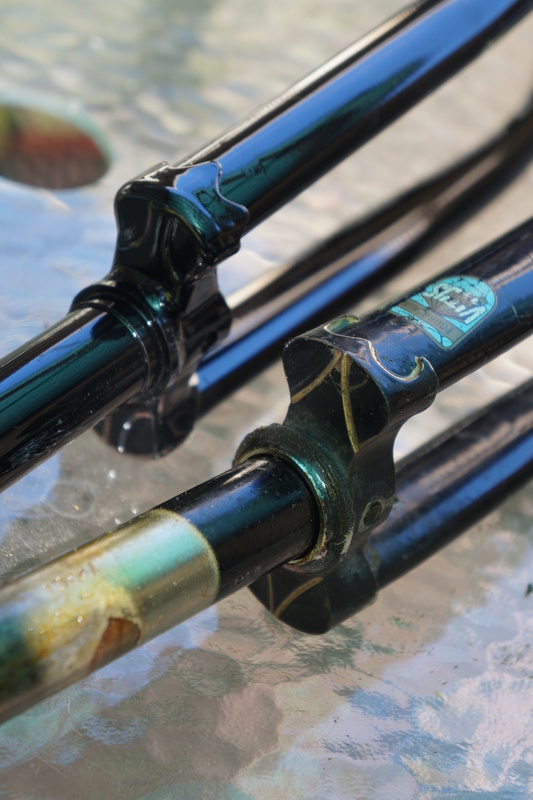 Kickstand is a vintage alloy Esge/Pletscher from Switzerland. New KMC red chain livened up the drive line and the tall ‘mustache’ handlebar added flair and easier riding posture. 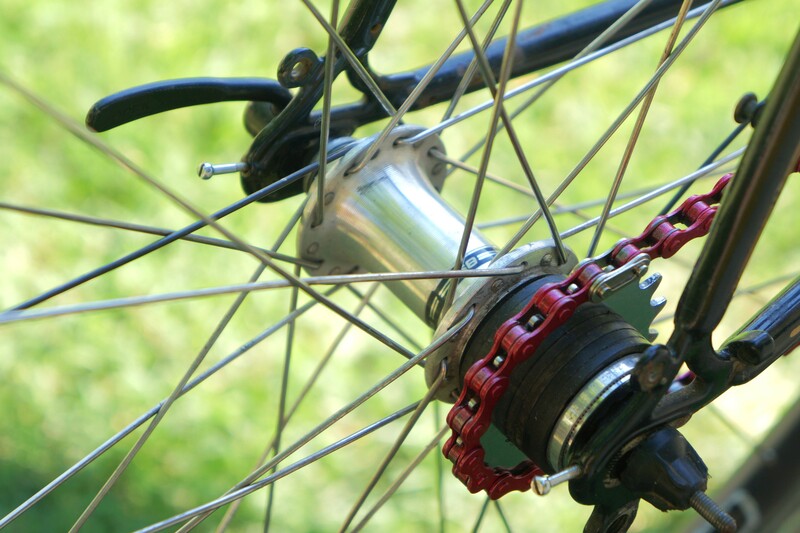 Chain-line was good after I moved plastic spacers-an advantage of free-hubs over freewheels. Flat rubber pad pedals from Electra Bike. Unless otherwise noted, all text and images produced and copyrighted by todgermanica.com and free to use or link for non-commercial use with attribution.